These lovely textiles found through Cheeky Textiles are just yummy. Even though everyone, from your Aunt Edna to the Art Gallery down the street, seems to be putting birds on things, for some reason it just works here. So much can be done with these fabrics. 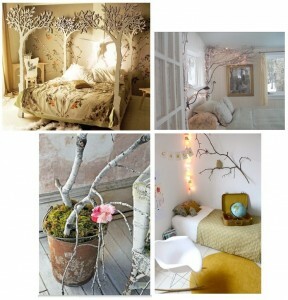 What about a sweet little lampshade covered in the goodness of branches and birds? We all work to make our homes personal spaces full of things we love. For us, another way to accomplish that is to bring the outside in. By incorporating elements of nature, we can create a warm, interesting space with texture and interest. Lately, branches have been creeping their way into the interiors of some pretty sweet spaces.